Taxation, tax credit for private intrastate adoptions, applicable to any private adoptions, Secs. 40-18-360, 40-18-361 am'd. 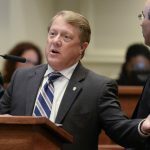 To amend Sections 40-18-360 and 40-18-361 of the Code of Alabama 1975, relating to tax credits for private intrastate adoption; to redefine the term private intrastate adoption; and to provide a tax credit for any private adoption of a child. (1) COMMISSIONER. The Commissioner of Revenue of the State of Alabama. (2) PRIVATE INTRASTATE ADOPTION. An adoption through a private agency in which the birth mother, the baby, and the adoptive parent(s) reside in Alabama. b. is placed in a licensed or approved foster home by the Alabama Department of Human Resources for the purpose of adoption pursuant to an approved case plan. A taxpayer shall be allowed a one time, refundable credit against the tax imposed by Section 40-18-2, for a private intrastate adoption or the adoption of a qualified foster child. The amount of such credit shall be $1,000 one thousand dollars ($1,000) per child adopted through a private intrastate adoption or qualified foster child to be claimed in the year in which the adoption becomes final." This act shall become effective on the first day of the third month following its passage and approval by the Governor, otherwise becoming law. March 27, 2018 S Assigned Act No. 2018-549.